This time last year, my semester in Spain was coming to an end. I was lucky enough to have been invited to spend the holidays in a suburb of Madrid. My friend’s father played guitar and led a chorus of 45 family members through song and prayer before a feast of traditional Spanish cuisine. I was truly overwhelmed, simultaneously feeling both extreme joy and sadness. Comparing my family to hers, and wishing that we were as strong a unit, diminished my ability to be fully present in the celebration. You have a choice. You can focus on what you don’t have or you can focus on all that you do. I have thought about this statement every day since. This interaction on the plane awakened me. Why could I only recall feeling grateful on good days, but on the days where I struggled, I hadn’t practiced any gratitude. When there are burdens, struggles, and drama, it’s hard to feel grateful. However, we are faced with a decision: do we wait until life gets better again or can we start where we are, in the midst of problems and challenges? Gratitude starts with each of us exactly where we are. Instead of waiting for a positive experience in order to feel grateful, we have the ability to bring gratitude to each and every day. Before I knew the power of gratitude, I was stuck. Yes, my family is a bit fragmented. But how much greater would it have felt to tell that man on the plane that both of my parents are my biggest fans, who support my dreams to live and study abroad? In the year since this interaction, I can attest that practicing gratitude has brought a sense of peace to my life that I didn’t know possible. Why? 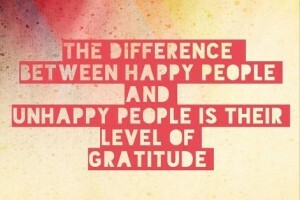 Because gratitude is a reciprocal process. 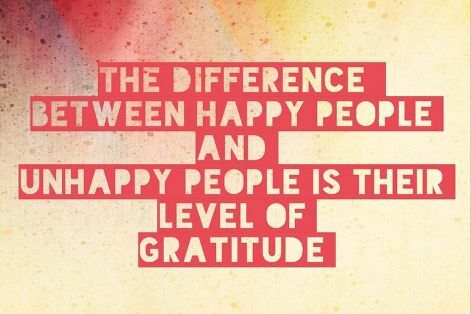 When you show someone you’re grateful for them, it boosts your own self-esteem and happiness. Let’s start now! As we head into the holiday break, make a mental list of the people in your life who you value. For first-year students: who has supported you through your transition to college? Who has worked to make you feel comfortable at Ohio State and who are you grateful to have met? Use your abilities to bring gratitude to each day. Start by letting those faculty members, advisors, Residence Life staff, peer leaders, family, and friends that you are thankful for their presence in your life. I challenge you to start with just one person. Gratitude catches on and spreads like wildfire. In no time, we will have cultivated a culture of gratitude in the Ohio State community. Whether you saw us at Orientation or at the library studying for an exam, FYE Peer Leaders are everywhere. As the wise Hannah Montana once said, “I’m a lucky [student] whose dreams came true, but underneath it all I’m just like you.” The best part of our role is that we are YOUR peers! We take classes, participate in student organizations, and eat in the dining halls–and, believe it or not, we were all first-year students at one point, too! We know what it’s like to complete your first big college exam and get chills, or question what to get involved with on campus. Let’s face it: college is hard, but we’re here to help you figure those hard things out because we all wish that we had a Peer Leader there for us during the low points of our first year as well. 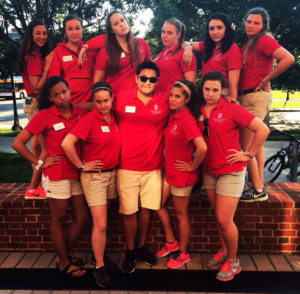 In order to continue building relationships and connecting with Peer Leaders, it is important to bust some myths about Peer Leaders. The only thing you should strive to be just like is yourself! Although the Peer Leaders are wonderful people, you should utilize their knowledge and resources to help you grow closer to the person you have always wanted to become. Discover the people and things that make you light up the same way each one of us lights up about the things we are passionate about. We have all made mistakes, trust me. I have made plenty of mistakes during my collegiate career and so has every other Peer Leader. The best feeling in the world when you make a mistake, however, is having someone tell you, “it’s okay”. That is exactly what we are here to do. We are not here to get you in trouble or instill our own values upon you, but rather love and support you through the best four–yet toughest–years of your life. Some of the greatest mistakes I have made here at Ohio State have in fact not been asking for help when I needed it most. No matter if you find support through your Peer Leader, family, friends, or other campus resources, make sure to have the courage to ask for help, because we all need somebody to lean on! This just might be the biggest myth of them all. I can 120 percent guarantee that each one of us is still trying to figure life out one day at a time, just like each of you. None of the Peer Leaders are perfect, and neither are you, but that’s okay! It makes us normal and unifies us as one Buckeye family! It is important to remember that even Ohio State’s greatest leaders do not have it all together, but together we have it all. When these barriers come down and myths are broken, you can finally start to see us for who we truly are: not the cool students in a red polo, but rather a genuine friend and resource who wants nothing more than see you find happiness and success here at Ohio State! I have heard so many people tell others to come out before it’s “too late”. Well, it’s actually never too late. Whether you come out at 20 or 40, it doesn’t matter, as long at you think it’s the right time for you. Personally, I came out when I was 15 years old and although it was young, it was the right time for me. Just keep in mind – you are never going to be completely comfortable telling somebody for the first time. You just have to take that risk, no matter what age you are. Being gay does not define you, nor anyone else, as a person. The concept that you have to act a certain way if you are gay is completely a myth and based on misguided stereotypes. It was a concept that I unfortunately believed in when I first came out and it really held me back from truly accepting who I was. Most importantly, remember that being gay is only a single part of you; it does not reflect who you are or what you are able to do/accomplish in life. One of the most memorable parts of my high school career was during government class, where we were having a discussion about gay marriage. The class was full with people who ran track with me, and I didn’t exactly think they were the most accepting people. I walked in thinking “Oh here we go.” As I was expecting, I spoke openly about gay marriage and debated with a girl sitting across from me. Class ended and my track friends started should “You go Big B (my track nickname)!” and “You totally rocked that.” The moral of this story: don’t judge people just because you think they will judge you. The people who you think are least likely to be accepting are sometimes the most accepting. When I first came out, I really didn’t have anyone to turn to and it really inhibited me from advancing in my life. Once I had a support system, it was easy to be who I wanted to be. Don’t be afraid to get involved with the gay community and take advantage of the Ohio State resources for LGBT students. I went to first-year LGBT cohort for my first year and it helped me to meet some of my best friends. There are amazing support systems available to you, and using these systems will really help in the coming out process. If you don’t want to use university resources, there are so many people around you who can help as well! College is a time of so much change, and sometimes that change can be difficult. But with the amazing resources at Ohio State and the level of acceptance at the university, there will always be someone by your side to support you in your decisions. Above all, remember that life is a gift and there is no need to waste the gift living somebody else’s life. Just be the best you that you can be! P.S. If you are straight and reading this, make sure to always be supportive to friends coming out and questioning their sexual orientation – it makes all the difference to them.